This one will take you back to the islands! 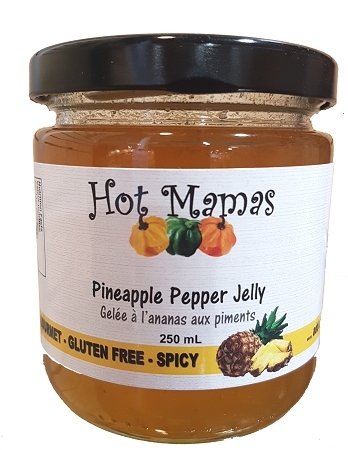 Enjoy the sweet heat of our spicy pineapple jelly, The perfect sauce for spring rolls, egg rolls, samosas, a stir fry, on chicken strips and nuggets, pizza and yes..fantastic on deep fried chicken wings or anything! Ingredients: Sugar, Pineapple, Pineapple Juice<,Vinegar, Scotch bonnet Peppers, Pectin.